I'm back! After a nice vacation from the Academic and Electronic realms, I am ready to start my 2012 Spring semester here at the University of Oklahoma as well as eager to create and update more content for my pride and joy, this blog. In the coming days I will post my yet unpublished papers from last semester in their respective tabs. By far the biggest news I have is concerning my newest acquisition, currently being featured in the 'NATO Project' tab. I have received through a confidential source in the United Stated Air Force [USAF] that had intimate knowledge of the NATO Operation Unified Protector and the US Operation Odyssey Dawn, the full set of 20 propaganda leaflets that were being dropped over cities in Libya during the aforementioned operations. 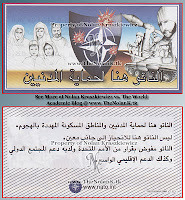 Currently I have posted all 20 of the leaflets - both back and front - in my new NATO Project tab. This is just the start of my project as I will be meeting with colleagues here at the University of Oklahoma in various departments to Dictate the Arabic from the leaflets into text, translate the Arabic from the leaflets, and analyze and breakdown the meanings of the imagery used on the leaflets. In a broader approach to understanding NATO Operation Unified Protector I will be researching the entire Libyan conflict and embarking on a research project encompassing every aspect of the 2011 Libyan conflict. I don't quite know exactly how this will look, but I am excited to start putting the pen to paper - or rather fingers to the keyboard. Thanks for reading and I look forward to your repeat visits and I hope the research papers I post in the days to come are enjoyed.